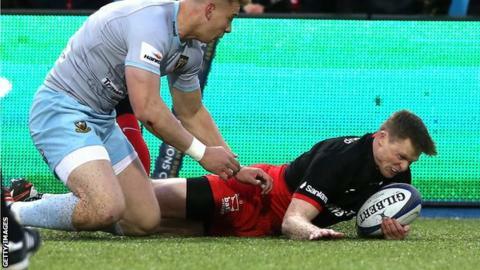 A below-par Saracens extended their unbeaten record in the Champions Cup by beating injury-hit Northampton to set up a semi-final against Wasps. Saints led 10-6 at the breaks thanks to a Ken Pisi try but missed chances to increase their advantage. Owen Farrell ended with 19 points and was integral to his team's comeback. Sarries' strength in depth told as Chris Ashton and Chris Wyles crossed the whitewash, and Courtney Lawes' late converted try was mere consolation. The hosts were the only side to progress to the knockout stages unbeaten and it is now 904 days since the Londoners last lost at home in the competition. But Saints - without England captain Dylan Hartley, Lions wing George North, scrum-half Lee Dickson, prop Kieran Brookes, flanker Tom Wood and number eight Sam Dickinson - pushed the favourites before running out of steam in the final 20 minutes. On 23 April, the Premiership leaders will meet Wasps, a side who reached the last four in extraordinary circumstances, with a last-second Jimmy Gopperth conversion securing a 25-24 win over Exeter. Saracens, who had claimed a try-scoring bonus point in all but one of their group games, were expected to romp into the last four, but Northampton but up a brave resistance. The visitors will rue letting 11 points go astray in an impressive start which had Saracens flanker Will Fraser sin-binned for a late tackle on Ben Foden. Stephen Myler missed two simple penalties, while wing Jamie Elliott failed to touch down after crossing the try line. The Saints eventually did score, the impressive Teimana Harrison breaking loose and feeding Pisi for the opening try which Myler converted, but it was their missed opportunities which will be the talking point. Saracens, a team which had six of England's Grand Slam winners in its line-up, kept within touching distance thanks to Farrell's boot, the England centre ending with a 100% record. After the break, the hosts were much improved and momentum was with them when, in the 69th minute, Ashton celebrated with a swan dive after good work by Alex Goode and Farrell. Shortly afterwards Wyles made sure of Sarries' progress, picking up a loose ball from 10 metres out and finishing. "In the end you go back to the first half and the opportunity to put points on the board. Poor old Jamie Elliot made a mistake in not finishing off a try-scoring opportunity. Brad Barritt and Owen Farrell have been to the fore and Mario Itoje is just one of those players who always catches the eye. In the final 20 minutes fitness tells, strength in depth on the bench tells." Saracens director of rugby Mark McCall: "This was a complex match for us. In the first half we didn't play anywhere near to the level that we can. "We just needed to find a way to turn the energy of the game around. Give Northampton a lot of credit because they put us under all sorts of pressure at the breakdown. "Good teams find a way of getting the job done. We were nowhere near our best and the last few weeks in the Premiership were almost too easy for us, in a way. Jim Mallinder, Northampton's director of rugby: "For 60 minutes we did pretty well - I was really pleased. Our defence was outstanding and helped by our outstanding back row. "We looked to attack them, not run into brick walls. We're disappointed to lose, but proud of the performance. Maybe if we had our international players, the final quarter would have been different."